Pull up any job and check its status. Live progress, arrival ETA, waiting time and signature feedback. 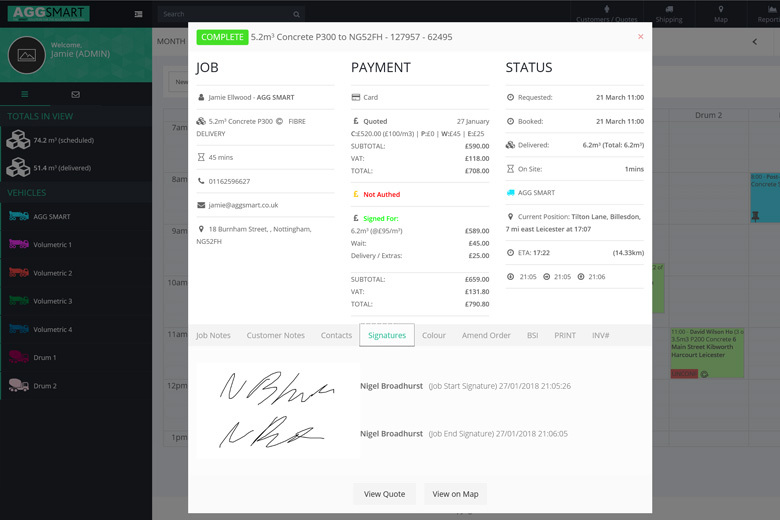 Allows you to manage your day and your customers expectations without having to call the driver. Payment status is displayed on screen and credit cards can be pre-authorised directly through the AGG SMART system. Our "cloud based" system is available anywhere you have an internet connection, just like a website. On your desktop, on your tablet on your phone. And as your data is backed up off site, you don't have to worry about data loss through fire or theft. And on the rare occasion of internet issues, our smart software always emails your schedule the night before as a safe-guard. 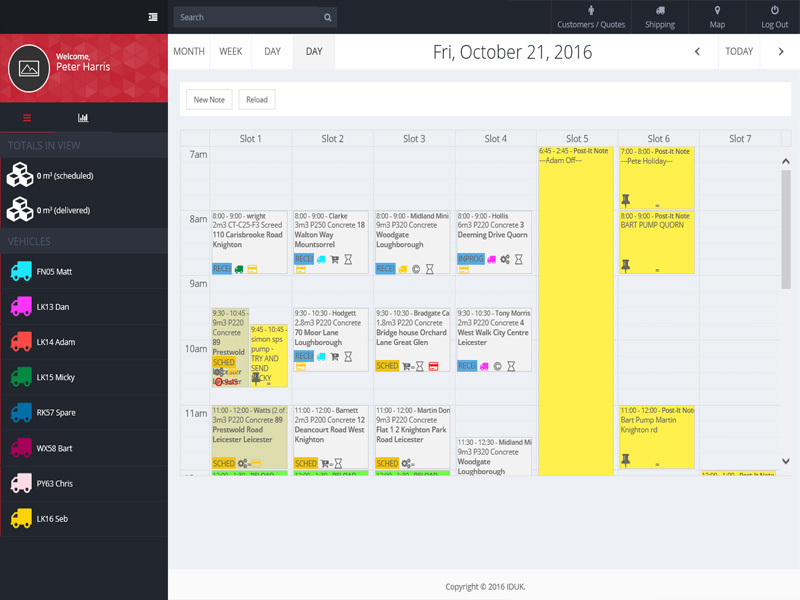 Intuitive drag and drop calendar creates a visual environment to plan and amend your working day. 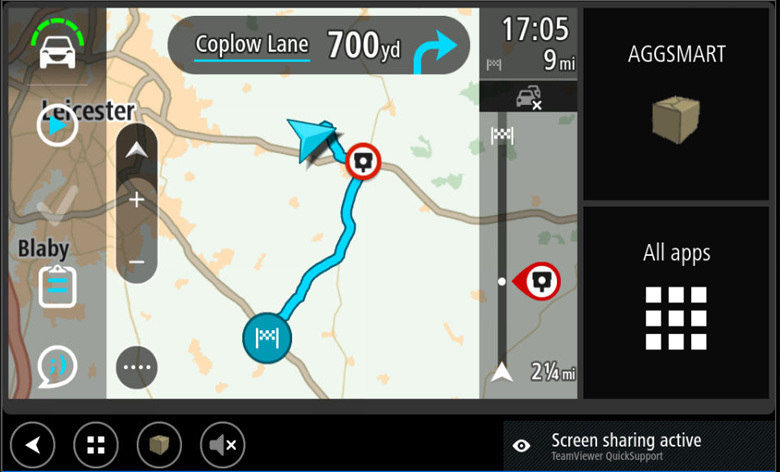 Monitor your fleet and see live delivery progress with our optional TomTom Webfleet integration. Custom reporting to instantly see which jobs are complete, which have not been paid and which need chasing up. All available as an Excel download. 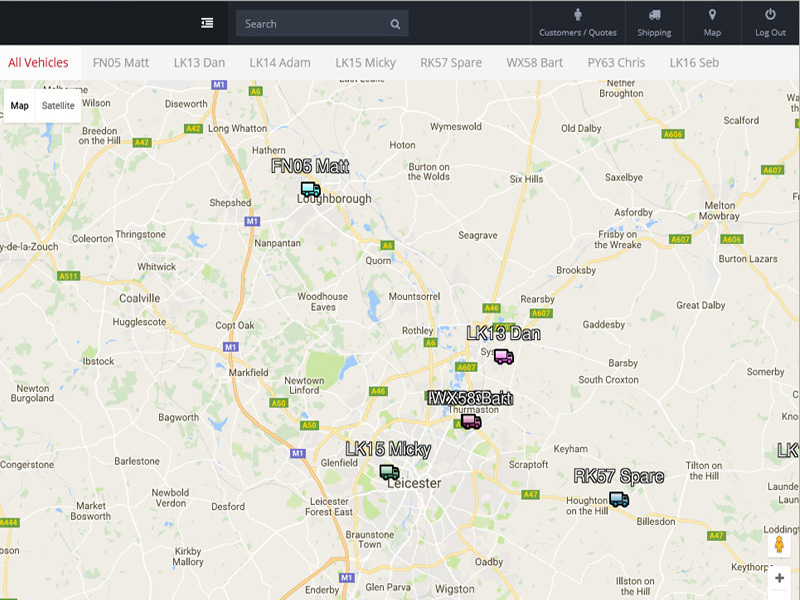 AGG SMART and TomTom Webfleet work together to provide live job updates and vehicle tracking. Jobs are sent directly to a tablet in the truck. TomTom calculates the most efficient delivery route reducing fuel costs. And, on site, additional costs can be calculated and a proof of delivery captured. This increases operation efficiency and offers a paperless ticketing system. Jobs can be recalculated live on site via the TomTom tablet, allowing extras such as waiting time to be added to the quoted price. 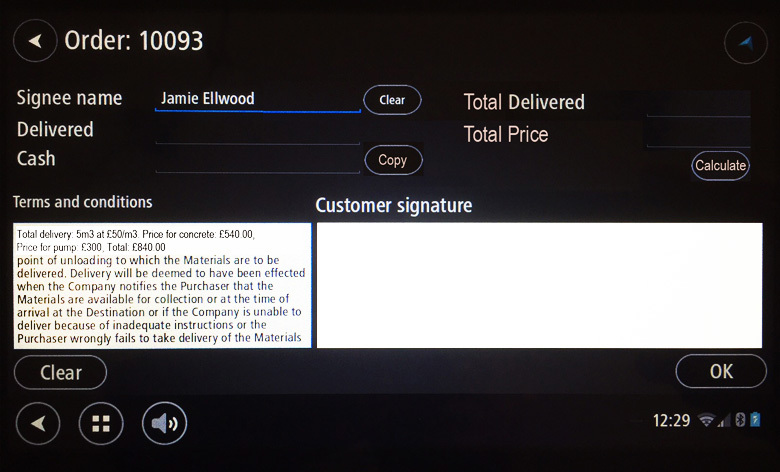 And customers sign on the tablet creating a paperless proof of delivery. And if your customer still wants a paper receipt, our bluetooth printer software will print off a copy on site. "AGG SMART has been a significant addition to our volumetric ready mix business, creating flexibility, traceability and efficiency in our day to day shipping and ordering process." Phillip Wright - Wright Mix. 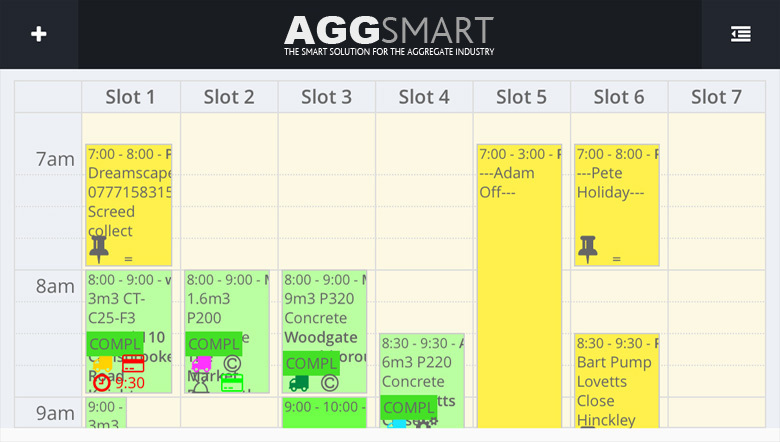 AGG SMART covers your complete end-to-end work flow, from quoting, to planning, to tracking, to delivery, to invoicing, and reporting. All integrated and working together to streamline your business and dramatically reduce operation and staff costs. AGG SMART is updated LIVE throughout the day, enabling your staff to work in collaboration, whether they are in the same office or in remote locations. Increase efficiency and reduce operational costs. 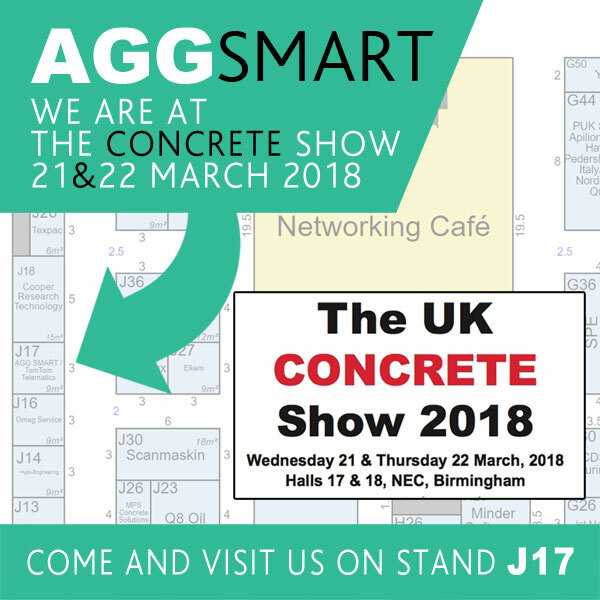 AGG SMART has been developed in conjunction with two large UK aggregate and concrete suppliers. This has enabled the system to be unique and specific for industry needs. And we are pro-actively working with all our clients to continuously improve and develop to the system, thus making it future proof. "AGG SMART has been a significant addition to our volumetric ready mix business, creating flexibility, traceability and efficiency in our day to day shipping and ordering process. With a detailed and easy to use quotation system integrated to our credit card payment provider it makes booking jobs on seamlessly easy. 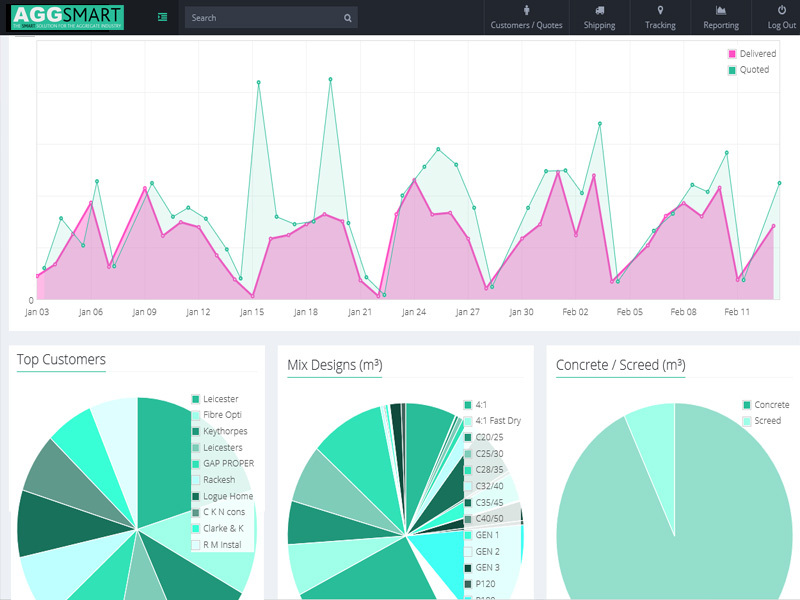 AGG SMART's support network and continual development has been exceptional and unlike other software providers I have experienced are prepared to listen to the industry and their needs." "As the number of vehicles we were running increased we found our office was struggling with a manual shipping system. The phones where hectic and required more operators to be able to book jobs on at the same time. By using this software it has revolutionised our office and allowed us to reduce office labour hours. With it being web based I am able to access it from anywhere at anytime. The software has allowed us to make the booking process easier for both sales staff and customer enabling us to make the booking, and take payment. 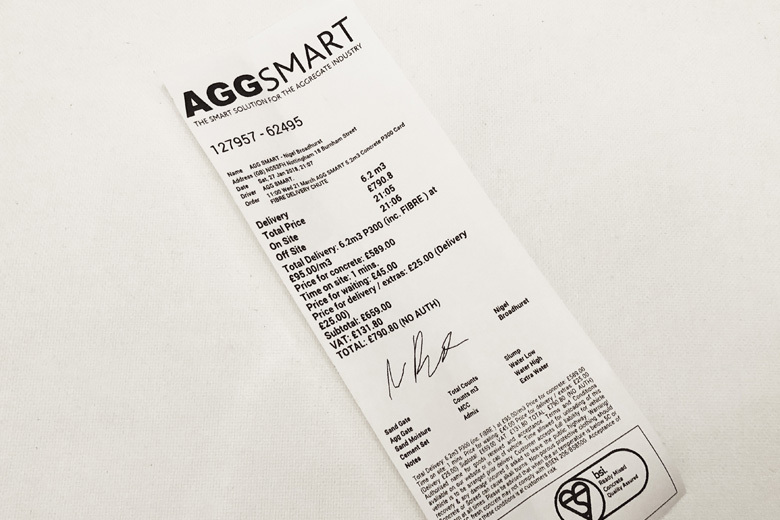 We have also found the system useful to chase up quotes that have been given giving us a chance to turn it into a sale.."
"AGG SMART has completely revolutionised the way we take on and distribute orders. Taking on up to 40 jobs per day, we had outgrown our daily worksheets and found it impossible to keep track of orders. AGG SMART enables us to move jobs around throughout the day, which is essential in the volumetric industry. We opted to have WorldPay integrated with our system which has helped massively with cash flow and reduced office labour hours. AGG SMART customer support has helped us every step of the way in the transition from manual shipping sheets to using the system full time. The level of service has been second to none. I recommend the AGG SMART service to anyone in the concrete industry." "Before we had AGG SMART and WEBFLEET, I was constantly on the phone to customers and our drivers - the days were so frantic. So much so that I would miss lots of calls during the day. Now, the office is very calm and I never miss a call"
"AGG SMART is only a recent addition to our company and is already proving its worth. From the initial booking in of jobs through to dispatch, completion and invoicing it is a smooth transition, reducing the need for manual intervention and in turn reducing the risk of mistakes being made. The AGG SMART team have given great service and back up." Add new customers to the system easily through our smart address facility (just enter the postcode). 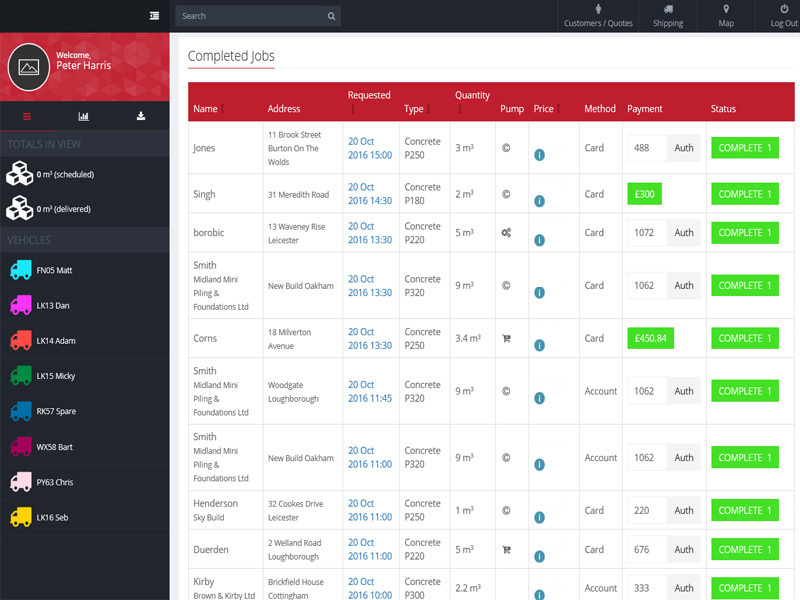 And search for existing customers via phone number, name or address to display previous jobs and add a new job. Intuitive visual calendar interface lets you "drag and drop" jobs directly onto a time slot on the virtual shipping sheet. Job status updates live on the calendar to give you a snapshot of the day's progress. Delayed jobs are highlighted. With optional TomTom Webfleet integration, jobs can be sent directly to your trucks for navigation to the delivery address. Delivery status is updated live and your complete fleet location can be viewed online. As part of the TomTom integration, the AGG SMART app integrates into the workflow giving you POD via signature and a requote function for under or over deliveries. Report live at the click of a button on a whole wealth of statistics. Jobs completed, jobs today, jobs not paid, quotes made but not transferred into jobs. Just a selection of the reporting available. Optional email and SMS alerts can be sent to customers before and after their delivery. An alert can be automatically be sent the evening before as a reminder of the order. And an alert can be sent after the delivery as a receipt of order. All data is stored securely on the AGG SMART server and all data is password protected to your account. All communication with the AGG SMART server is secured by an SSL connection and all data is backed up offsite every night. Upload your specific pricing sheet to AGG SMART and quotes are calculated automatically depending on material and quantity. Or you can override the automated system for special pricing. Never mis-quote a customer again. Jobs with multiple deliveries are handled easily on the calendar. A job quoted over one load will automatically be split into multiple loads and these can be dragged onto the calendar as required. Under or over deliveries for volumetric concrete are requoted live on the system with our TomTom integrated app. Completed jobs can be automatically downloaded and imported into your accounting software for invoicing. AGG SMART integrates into World Pay and other leading online payment gateways. This enables you to pre-authorise payment before delivery and collect the balance on completion. Or just take complete payment at point of sale. AGG SMART integrates into leading phone systems to enable live call logging. 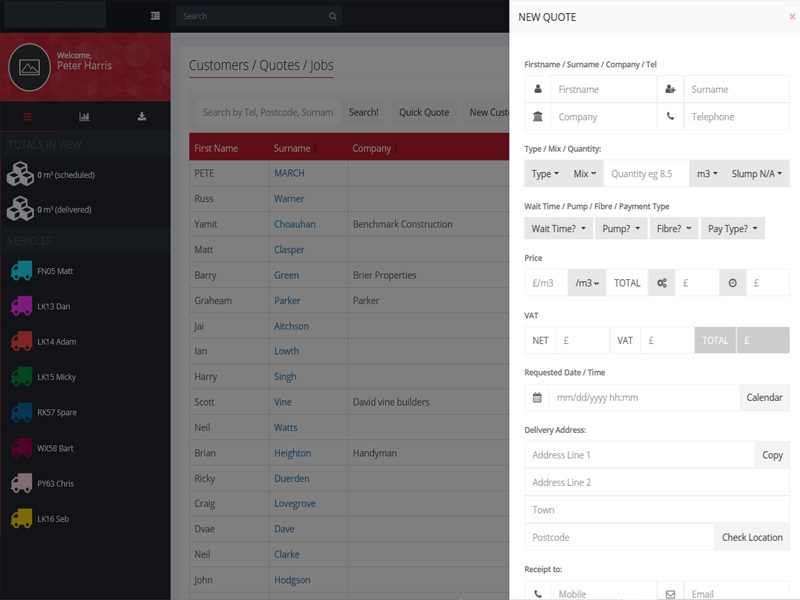 Existing customer details can be brought up on screen as the handler answers the phone, or for new customers, the phone number is automatically added as part of adding a new customer. AGG SMART is a managed solution. Our friendly support team are always on hand during business hours to help you with any queries you may have. We can also import your existing customer database into our system to ensure a seamless integration. We are also continuously developing the system to help your business grow and become more efficient. If there is anything specific you need for your operation, our team of specialist developers can add in bespoke functionality. For customer management, quoting, planning, shipping, tracking, invoicing, and reporting. We have you covered. There was a problem sending your message. Please, try again and please make sure you have ticked the "I'm not a robot" box. Streamlining your operations for efficient business.